Roma was handed one of the hardest draws in the quarterfinals of the Champions League. But the Italian side took it to Barcelona and in the end, were only undone due to individual errors. Roma had the first chances of the match and should have been given a penalty in the ninth minute after Edin Džeko was brought down in the box. From then on Barcelona started to slowly take control of proceedings while at the same time failing to completely dominate Roma. Instead, the Italians were sitting deep and attempted to hit Barcelona on the counter-attack. Roma at times looked dangerous, but you need to be perfect on both ends of the pitch if you want to get a result against Barcelona. In the 38th minute, the Catalans opened the scoring after captain Daniele de Rossi scored an unfortunate own goal. A second own goal in the second half and lapse of concentration as well as squandering several key chances in the second half allowed Barca to run up the scoreline. 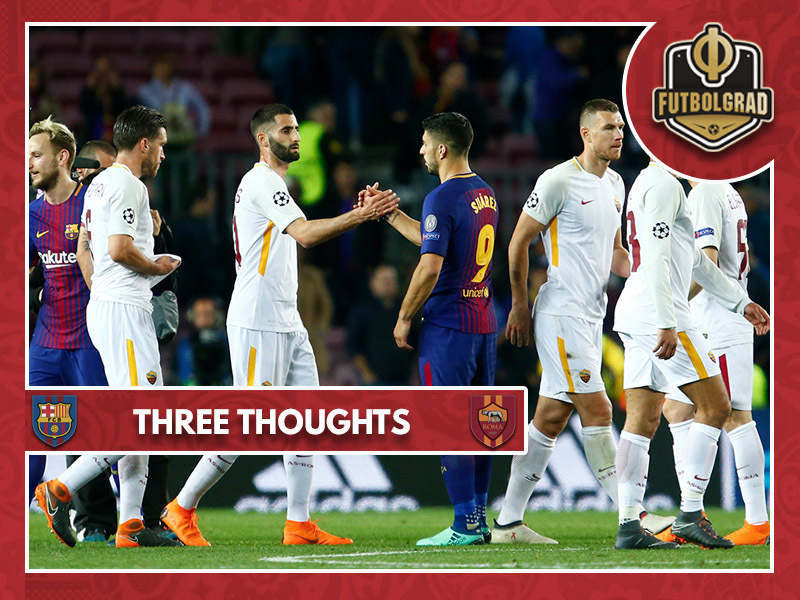 In retrospect Barca’s 4-1 victory seemed perhaps a goal too much, but the Catalans were efficient when it came to capitalising on mistakes committed by Roma. Roma could be looking ahead to a bright future. In the end, Barca outclassed I Giallorossi and without a miracle in Italy Roma’s Champions League season will end next week. The club, however, can look back to this Champions League campaign with a lot of pride. Finishing first in a group that included Chelsea, Atlético Madrid and Qarabag, as well as eliminating Shakhtar Donetsk in two attractive matches in the round of 16, Roma were one of the most fun teams to watch in the competition. Despite American ownership, Roma are limited by Financial Fair Play, which has led to the departure of key players like Leandro Paredes and Mohamed Salah. But sporting director Monchi has made the most of the limitations. Like it was the case at his previous club Sevilla Monchi is a master when it comes to discovering talent and selling them on at a premium. As a result, Roma were able to keep some key players at the club and also bring in great additions like Cengiz Ünder, Lorenzo Pelligrini and Jonathan Silva. Last years signings like keeper Alisson, who could be the next big Monchi transfer, have made a step forward and with money coming in through transfers while finding new players on the cheap Roma are slowly but surely growing into a club that could challenge in Europe. 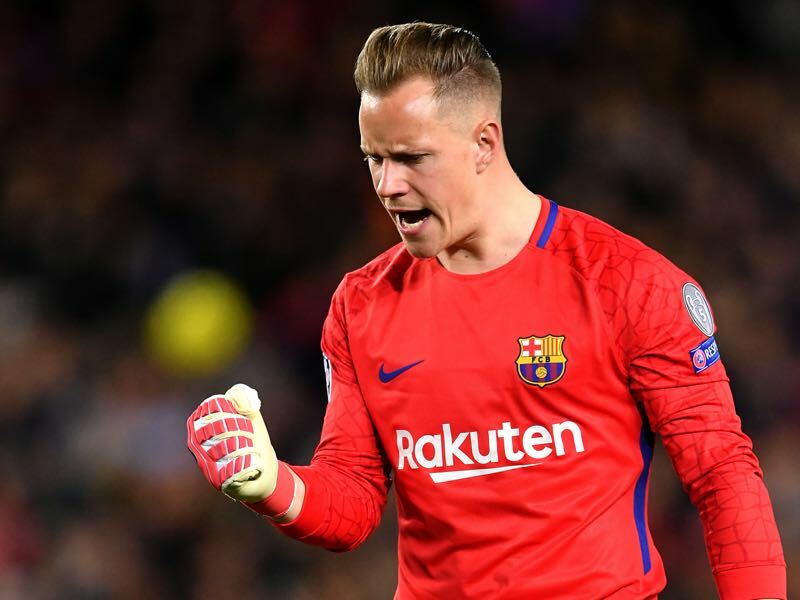 Both Barcelona keeper Marc-André ter Stegen and Alisson were not without flaws in this game. But at the same time, both highlighted that they represent the next generation of top keepers in the World game. Barcelona’s ter Stegen is already widely deemed one of Europe’s best and did a fantastic job at last summer’s 2017 FIFA Confederations Cup – where he was the number one for most of the tournament – and replacing Manuel Neuer in Germany’s goal in the last set of qualifiers and friendlies. Once Neuer will be back Germany will be in the very fortunate position to take two keepers to Russia that represents the highest level. Should Neuer not regain fitness in time ter Stegen will be more than just a replacement. Challenging ter Stegen for the World Cup next summer will be Alisson with Brazil. The Roma keeper is perhaps one of the biggest goalkeeping discoveries this season. The Brazilian with German roots has been fantastic at times this season and like Neuer and ter Stegen has excellent ball playing abilities that easily qualify him as a sweeper keeper. Great in the buildup Alisson could make a big money move to either England or Spain, where he is linked with Real Madrid.